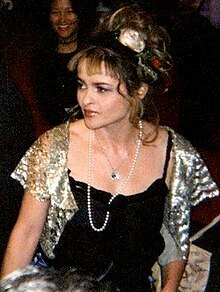 Helena Bonham Carter (born 26 May 1966) is an English actress best known for her roles in costume dramas, as Bellatrix Lestrange in the Harry Potter series and as Mrs. Lovett in the film musical Sweeney Todd. I'm convinced that whatever state you're in during your pregnancy has a huge influence on the baby's personality - so I hope we haven't produced a little serial killer! Famous people come up to me, but I don't know who they are because my sight is so bad. It's always at the pool of the Four Seasons in Beverly Hills when I don't have my lenses in and my glasses are in my room. … With the number of people I ignore, I'm lucky I work at all in this town. I've aged, but I don't think I've grown up. On the day Billy was born, it was like walking through a mirror and everything was Technicolor. My life had been very work-orientated, and all in close-up. Once I had the family it went into sudden widescreen. I think it's quite an extreme statement - it might be my ultimate attempt to put the corset to bed. But I think I've still got a bit of a sado-masochistic streak in me, because if I'm not going to be restricted by corsets and covered in lace, then I still wind up wearing an ape-mask over my face. I do wonder how I get myself in these situations! Of her role in Planet of the Apes.